I've been spending 1-2 hours per day in the garden since we got back from Hawaii. It's part of my daily routine, while applying for jobs, and working on some special math/programming projects I've been waiting for school to end to work on. 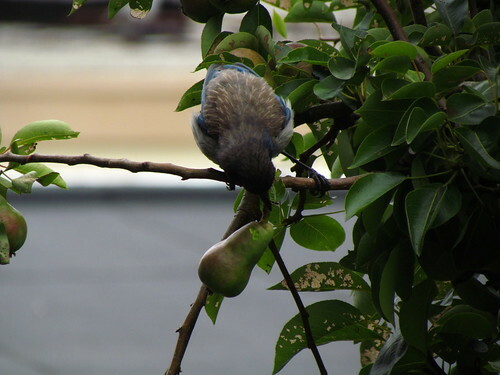 In the garden, mostly I prune. I reduced the Ceanothus crown ~50%, which is 20% more than I understand one is to supposed reduce a crown in any given year. Well, it seems to be making new leaves already. Opening up the crown and lifting it up a couple feet sure let a lot of light in to a corner of the garden. No pictures of that today. Maybe next time. 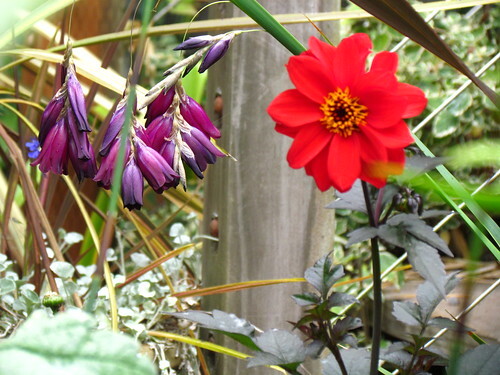 Today we have fuchsia and dahlia. 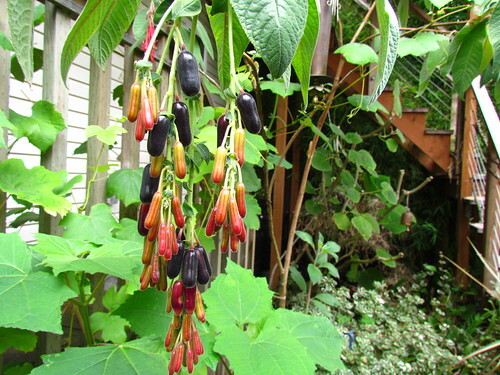 Big, dark (edible) berries follow the flowers on the red Fuchsia boliviana. I pruned the daylights out of Fuchsia 'Miep Aalhuizen' several weeks ago. It was that or take it out. 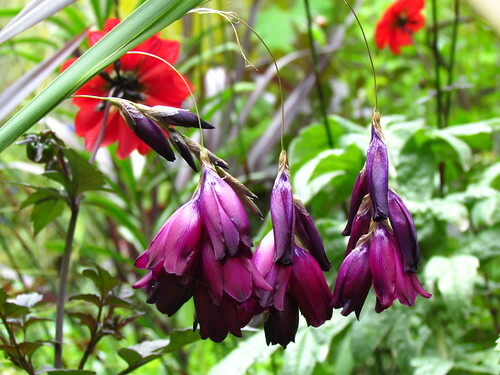 Dierama pulcherimum I grew from seed a number of years ago has made flowers again this year, the second year in a row. The seed came from Seed Hunt over there in my seed source links. 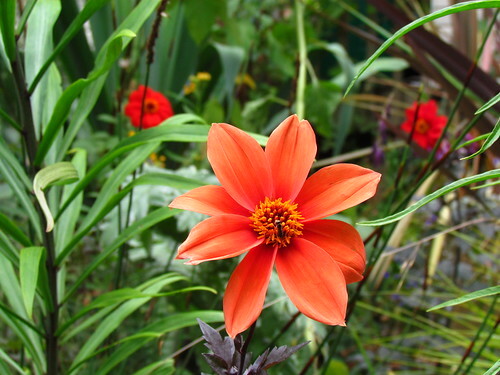 Germination was easy, but flowers took three years. Just a few flowers at a time now. In the future, hopefully more. This yellow one has an odd defect. It drops one petal a day or two after the bud opens. Sigh. 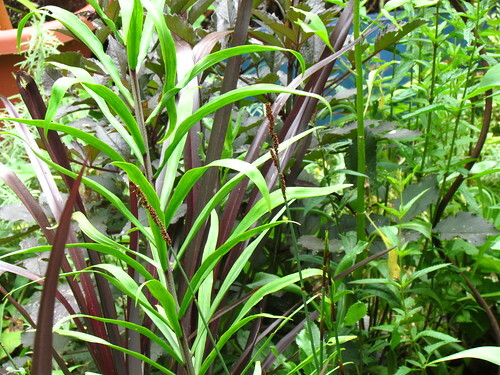 I planted that fancy (expensive) cordyline I bought at Sierra Azul. It flowers pink in winter? We'll see about that. 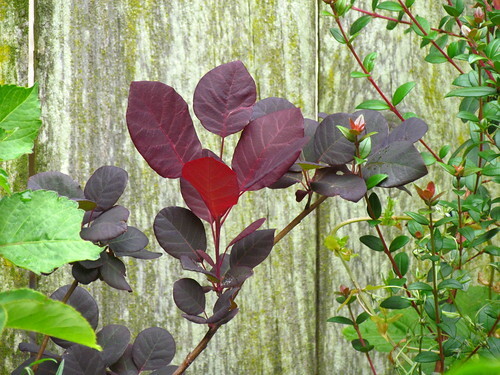 I have a smoke bush too. I bought it in a 1-g pot a couple years ago. It's in a bigger pot now, but I'm thinking about using it to replace the princess plant (Tibouchina urvilleana). I don't know why the princess plant has never been very happy in my garden. 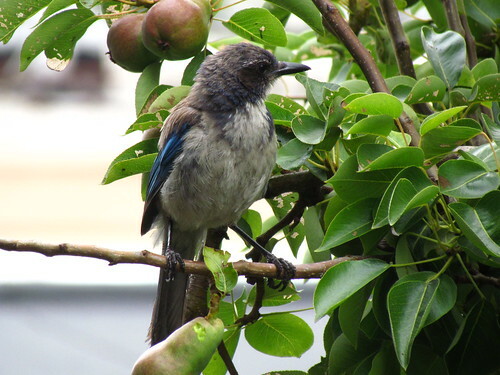 They flower all year in San Francisco, but not in my garden. I rarely get more than a couple months of bloom and then it looks frankly miserable. I've tried being patient. 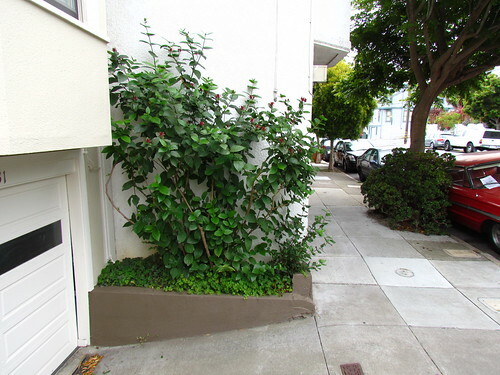 Maybe a smoke bush would be better? Maybe it would not. I don't know. The uncertainty stays my hand. The buckeye got big this year. My plan is still to prune all the leaves off when they turn brown in a month or two and then prune the wood in winter to keep it shrub-sized as I've read in books. 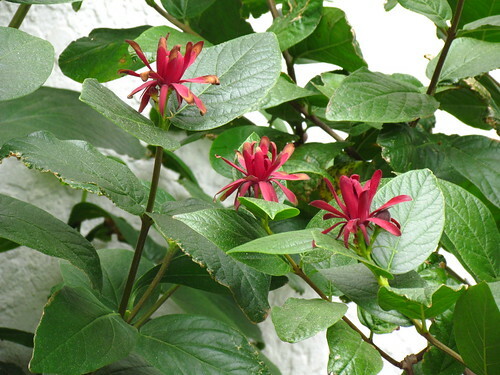 That strategy has worked with the Calycanthus occidentalis in the front yard. I could thin it a bit, I suppose. That's a narrow planter for a spicebush, but I am pleased with the result. Plenty of flowers this year too. Back in the backyard, Bartlettina sordida is recovering from the hard prune I give it ever year after the flowers. 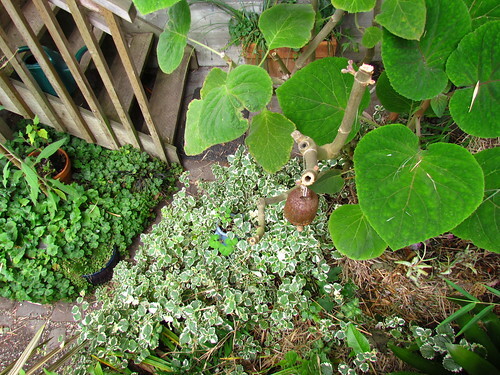 And that plectranthus has been a fine companion for it underneath. My one little stab at variegation. 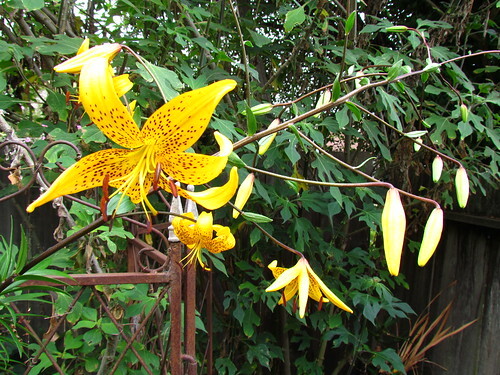 Lilies have started to flower. This is some random nursery lily. 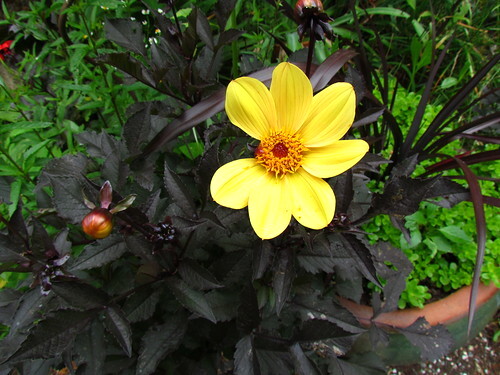 It's been very reliable for me, blooming heavily every year and growing ever more stout. I keep it in a pot. My next project for tomorrow and Wednesday is to fix this dreadful planter under the deck. 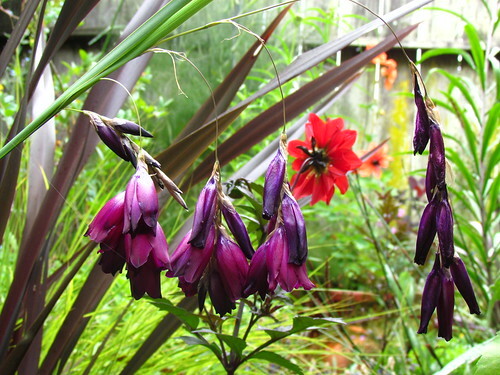 Maybe I'll just cut back the iris leaves and try to encourage the the campanula fill in. 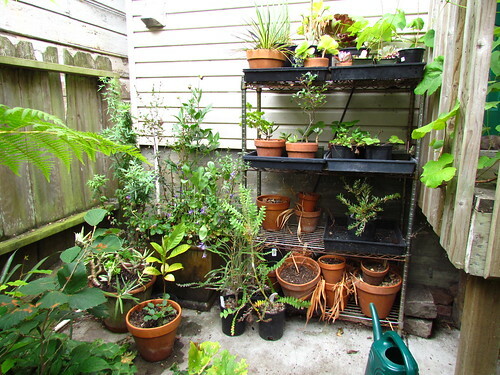 I had a Japanese maple in there once but it grew lanky and got in my way and I am heartless. 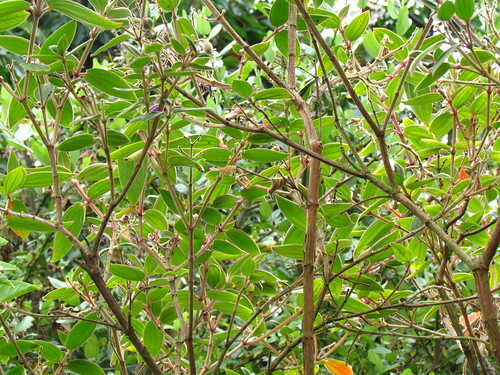 Also some chewing insect regularly massacred the leaves. Bleargh. I found a lot of dead plants in the nursery when I tidied up and swept. 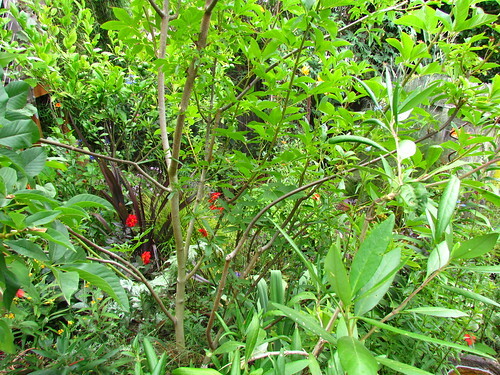 The native Berberis nevinnii (on the left next to the fence) I grew from seed was doing well tho'. 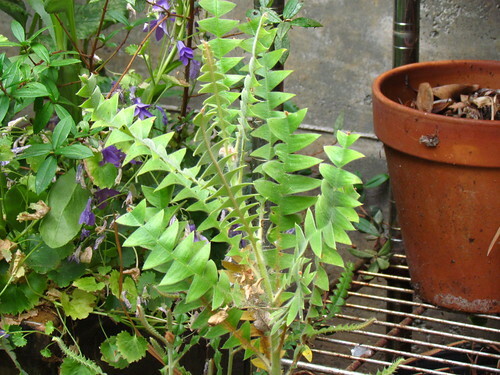 My garden is much too small for a thorny plant like that so I keep it in a pot in the corner. I'm sure I'll find a place for it in a bigger garden, when/if we ever move to the suburbs. There's always a place for thorns in big gardens, right? My little Banksia collection is doing well. It's 8 pm. Sorry for the abrupt ending, but Guy wants me to finish making dinner so we can eat. We're having (vegetarian) Sloppy Joes. Your well-tamed spicebush is inspiring. I may dare to plant one, one of these days. You lucky dog! In my garden, queen flower is either an expensive annual or has to be brought inside for the winter. Those fuzzy leaves are pretty cool even without the flowers. I MUST go out to prune and clean the yard of leaves and twigs, but I've had so many activities. And now, oh my, the heat has arrived with a vengeance. 108 is forecast for today. Enjoy that marine layer you are getting. Our heat is pulling it in; just wish it would come farther inland. Your garden is beautiful! 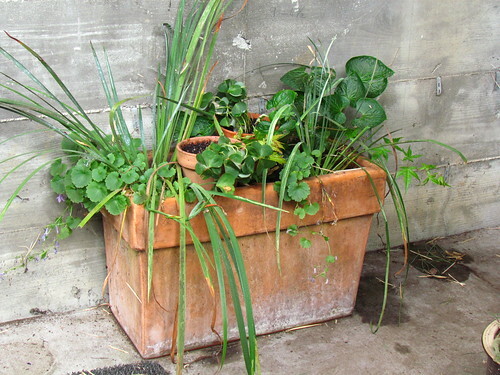 I can only imagine being able to garden, and to have a flourishing garden year around!! 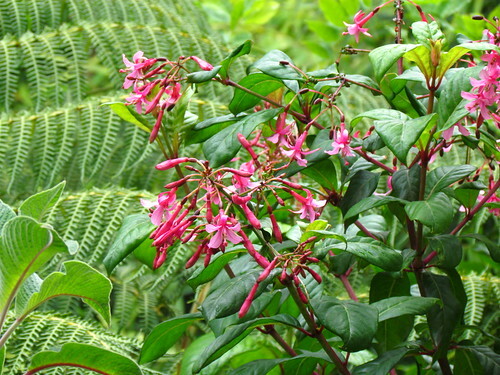 Have you eaten any of the Fuchsia boliviana berries? 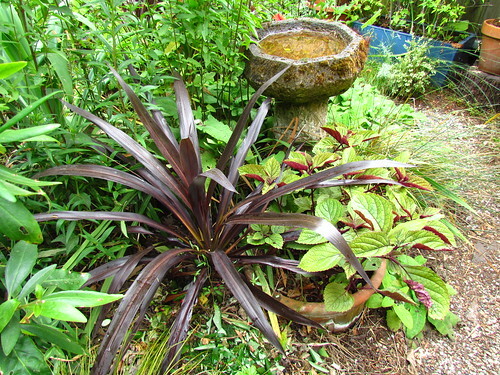 Yes Cordyline is a winter bloomer. The flower panicles are actually pretty showy and are followed by nice berries. Yours might be a bit small yet. 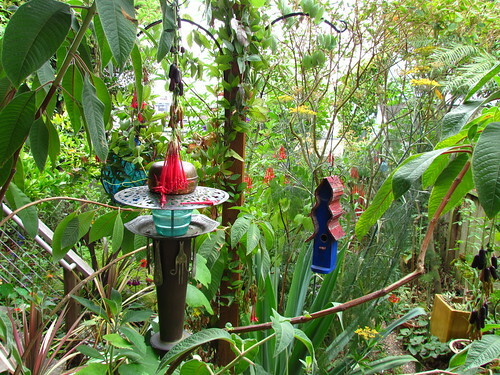 If you stick with that dark red color scheme you could be the West Coast version of Christopher Mello's Asheville garden. Ruthlessness is a requirement.